It sounds like you are describing the stems of flowers going to seed. 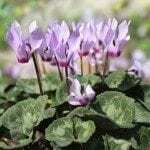 Peak down into the centers of your Cyclamen and see if you see any flower buds forming. 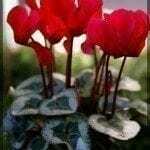 You could feed the plants with a light fertilizer that is meant for bloom promotion. Division of plants can be done in late summer.